The eighth episode of Gotham’s bobbing second season lives up to the show’s history of broken promises. “Tonight’s the Night,” as a title, was derived from more than a line of Theo Galavan dialogue. With the hour centering on the series’ most vilified character, Barbara Kean, it had to be. Her grand hope for the evening is the death of former love James Gordon. The viewers’ grand hope, this one included, was for a far different outcome. 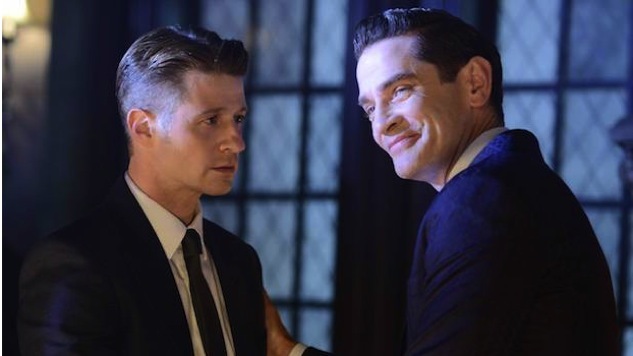 Despite the episode’s cowardice in putting a lame horse to rest, “Tonight’s the Night” is one of the Gotham’s best efforts, of either season. Though the serialization format has not brought sweeping change like I’d hoped, it has allowed for more focused entries, nothing short of revolutionary for a show that spent its first season burdened by the weight of too many stories. That has not been an issue this year, and it was not so last night. The hour has three distinct storylines: Gordon vs. Barbara, Theo attempting to extort Bruce and Ed racing headlong into supervillainy, all of which is well organized and exists within a clear hierarchy. The episode’s main storyline dragged at times, and by the halfway point I was begging for something to happen. Thankfully, just as I cast my wish, it was granted and out came the guns. Barbara and Gordon bring expected fireworks, and the ambush sequence is one of the drama’s better executed action scenes, though it’s too brief. What I like most about the showdown, though, is what it brought out of our gruff police detective. I have become frustrated with Gordon’s terse, one-dimensional persona in which anger is his primary emotion and when it isn’t, it’s something close to melancholic fury. It is heartbreaking for anyone who knows the kind of character he can be. In the pages of DC’s most popular book, the detective-turned-commissioner is complex, a man fighting for justice in a broken world moving ever closer to becoming a madhouse. Gotham has accomplished the madhouse aspect, but its hero lacks any of the humanity that distinguishes him from the capes in Batman tales. In “Tonight’s the Night,” however, we are given a small glimpse at a softer Gordon. Sure, he is doing it to illude Barbara, but the early scene in the interrogation room is perhaps Ben Mckenzie’s best in the show’s run—a promising example of what he can do when given a scene with legs. McKenzie isn’t the only effective performer in the hour, either. Save for Michael Chiklis, who has thus far been wasted and, in most scenes, appears bewildered as to how he ended up in this farce, much of Gotham’s actors looked at ease. Credit goes to Jim Barnes, who penned a solid episode that, not without its blemishes, stands among the season’s best. The most disappointing plot of the evening comes from Theo and Bruce, in part because James Frain’s antagonist has not lived up to his early mystique, serving more as a generic, hollow evildoer than anything of real merit. More annoying, however, is the continued notion that Bruce is more than a kid, and the constant push to put the character into adult situations. His meeting with Theo is absurd, something he never should have attended alone. A simple addition of Alfred in the room and Bruce then dismissing him, could have allayed the problem. But, the show is stuck in Bruce’s own teenage thinking. He prefers, as do many teenagers, to see himself as an adult and the series does as well. What it leads to is awkward and inappropriate encounters, and while there is clear dedication to illustrating the rise from boy to Batman, I am forever wishful for Bruce to be treated as a normal kid. But, it is too late for that. Lest I go a review without mentioning Edward Nygma, let me note that he is once again a bright spot. His burying of Ms. Kringle plays out as a farce, and I wish more time had been spent here than with Theo and Bruce. Moving forward, the pairing of Ed and Penguin will hopefully bring about the kind of nerd joy that The Flash and Arrow cater to so well, though I am not holding my breath. I would also be remiss to not mention the directing work of Jeffrey Hunt. One of the more surprising aspects of Season Two has been its visual improvement over the inaugural campaign. While I am still often befuddled by the mise-en-scène, which blends eras (I’m guessing purposefully) to a confusing degree, the camera work and structure of shots (and, most impressive, the lighting) has been confident and consistent much of the season. If the show could bring its writing to the same level, Gotham could become sneaky stylish, but there is much to improve before that gap can be narrowed. ?In an episode that would rank as one of the series’ brightest, there is still reason to be dismayed. More than anything, Gotham lacks conviction, and it’s inability to end Barbara Kean last night was another missed opportunity for the writers to prove they are in control of the story. I should mention that Kean’s fate is not certain—Lee notes that she was in “critical” in the waning moments, but if her death is pushed a week it would be a bittersweet letdown. Gotham should learn from its earlier success with Jerome’s killing, and allow the axe to drop with finality more often.